I got to see a nice little photography exhibit today at the Blanton Museum of Art on the UT campus in Austin. Thanks to a reminder from my friend Andy, I got in to the exhibit on a free admission day before it wraps up this weekend. 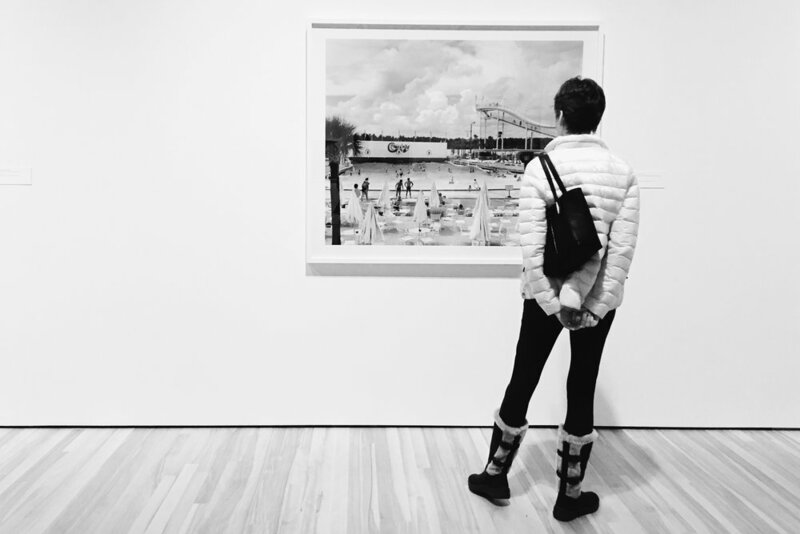 The exhibit was all about the travels of several photographers on the American roads and included such greats as Robert Frank, Gary Winogrand, and William Eggleston to name a few. It is always a treat to see museum quality prints of photographs of familiar images. I have books by some of the featured artists and it was interesting to see the large prints that were selected for exhibition. There was a good assortment of black and white, along with color images. Of course, I tend to favor the deep silver gelatin black and white prints myself. The exhibit was fairly small but it was a decent representation of the theme. One omission in the artists that occurred to me is Richard Avedon. His work on his The American West project would have been appropriate, although I suppose it is more portrait oriented than the images that were presented here. I was happy to discover the work of one new-to-me photographer. Some images by Shinya Fujiwara, a Japanese photographer who did a road trip in America in 1988, had a kind of surreal feel that I found fascinating. Sadly his book American Roulette is out of print and is quite expensive in the used market.